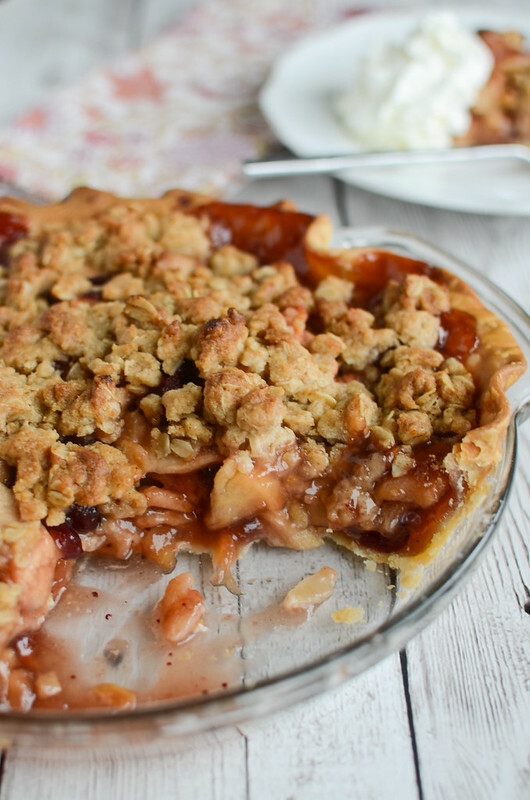 Apple Cranberry Streusel Pie – your new favorite Thanksgiving pie! Apples and cranberries topped with a crunchy streusel topping! This is probably my favorite post I do all year. I love giving away a couple Butterball turkey checks every year before Thanksgiving.I really have no idea why but I look forward to this post all year. I think the turkey represents Thanksgiving for me and I love feeling like I can be a part of your Thanksgiving meal. It’s pretty cool. So whoever wins, send me pictures of your Thanksgiving meal! Butterball’s theme for this year is #TBT (Throwback Thursday – but we’re doing it on Tuesday)! So I’m sharing a couple of my fave Thanksgiving #TBT photos! This one is from 2007. 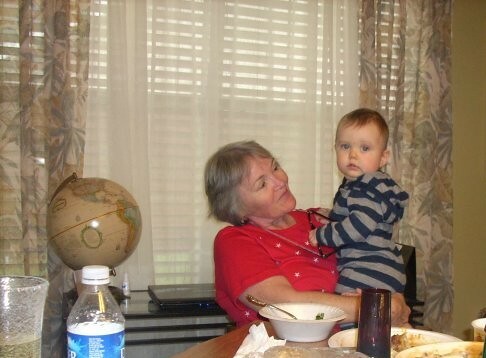 It’s my lovely grandma and my first baby on his first Thanksgiving. We haven’t had Thanksgiving in our hometown in, maybe, 5 years now and every year I stalk Facebook and Instagram waiting for photos of the family. Plus, how fun is baby’s first Thanksgiving? They eat ALL THE FOOD. 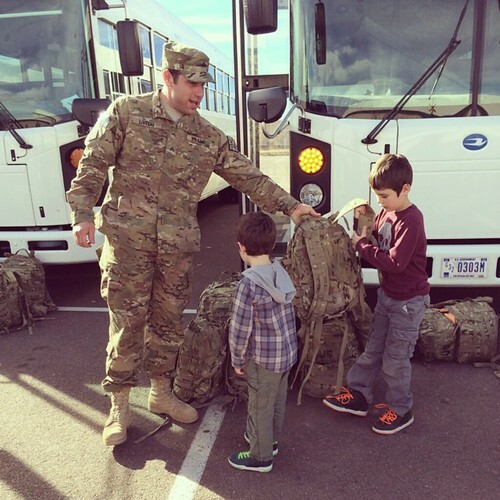 This one isn’t much of a #TBT but last year my husband came home from his second deployment ON Thanksgiving. In the middle of the day! So I did all the prep work for the meal in the morning and then we managed to pull it all together by dinner time! 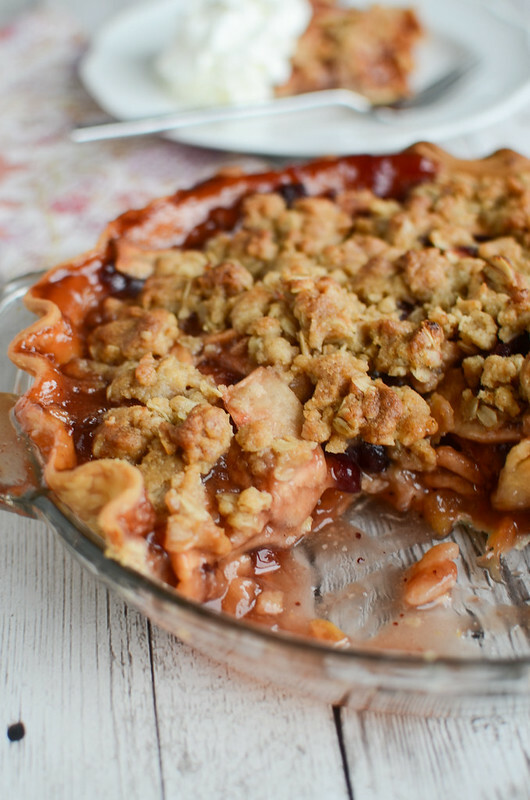 I thought I’d share this Apple Cranberry Streusel Pie today, too! I made it twice last week. The first time, it didn’t cut nicely. It didn’t the second time either but it’s so good that I’ll forgive it. Yes, I’m admitting that my family ate 2 entire cranberry apple pies last week. Make sure you use the Rafflecopter below to enter to win a Butterball turkey check worth $20! That’ll get you a pretty good sized turkey for your Thanksgiving meal! This is a quick one so I can get the check to you in time so don’t wait! The giveaway ends 11/19 at midnight! And remember that Butterball has their Turkey Talk-Line experts who can offer 30+ years of experience, tips, recipes, and more! If you have a turkey emergency on Thanksgiving, call 1-800-Butterball and they’ll help you out! Or tweet them @Butterball! To make the streusel, combine flour, 6 tablespoons llight brown sugar, oats and cinnamon. Stir in melted butter until mixture is crumbly; set aside. Roll pie crust on lightly floured surface to an 11-inch circle. Fit into a 9-inch pie plate. Fold excess crust at edge under. Press dough together on rim to form a thick crust edge. Form a decorative edge using fingers, fork or other utensil. Combine apples, cranberry sauce, remaining 3/4 cup light brown sugar and cornstarch. Spoon apple mixture into pastry-lined pie plate. Sprinkle with streusel. Bake about 1 hour, or until apples are tender. 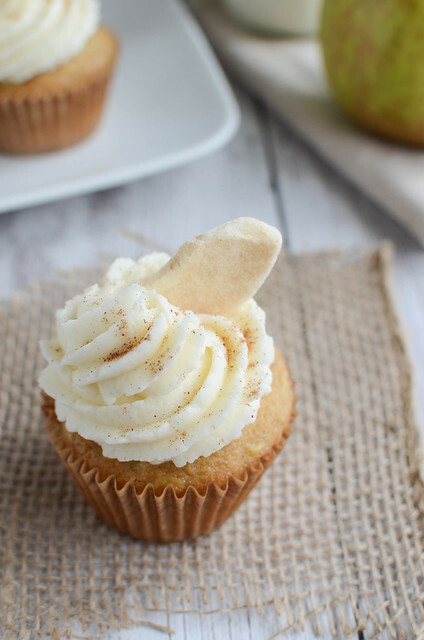 Serve warm with whipped cream or vanilla ice cream. 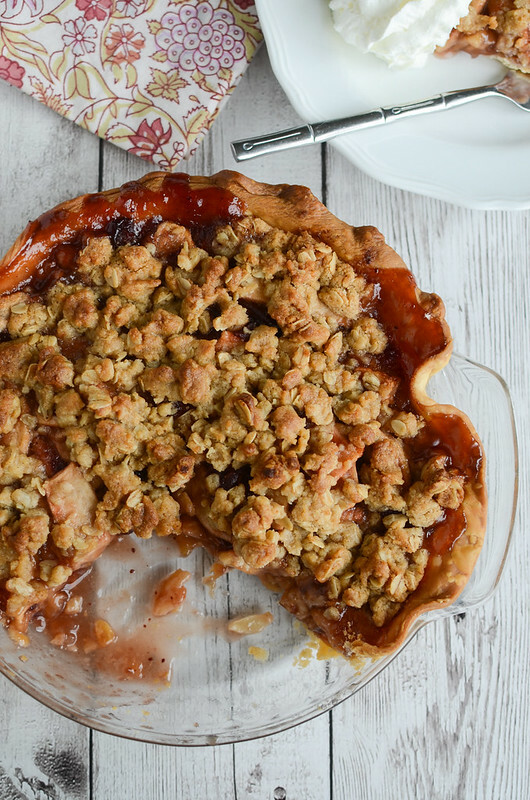 34 Responses to "Apple Cranberry Streusel Pie (plus a Butterball giveaway!)" My favorite Thanksgiving #TBT memory was when my daughter discovered she was taller than me as I was preparing the meal. 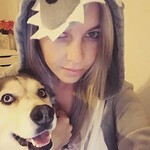 I was sad to discover my child was growing up but now we think it is so funny. My #TBT Thanksgiving memory is making dinner for my family and watching football!! Favorite throw back memory is just whenever my entire family is able to get together for the holiday. We fry up some turkey, make lots of dinner rolls and just hang out in the kitchen talking and catching up! We don’t get to do this often but is fun when we do! Last Thanksgiving, because it was my first year having to cook everything! My favorite TBT Thanksgiving memory is several years ago some friends and I planned and held our first Friendsgiving. So much fun! My favorite #TBT Thanksgiving memory is when we would go to my Grandpa’s farm, we would always go exploring and play with the geese. I found out years later that we actually ate some of those geese for Thanksgiving dinners.. I always prefer Turkey these days lol. Thanks for the chance! My favorite Thanksgiving #TBT memory was spending it with my dad three years ago, because it was the last time I was able to spend Thanksgiving with him before he passed. Getting ready to serve the pie, only to find it in crumbs with a sticky dog next to it! Too funny! Sounds like something mine would do! 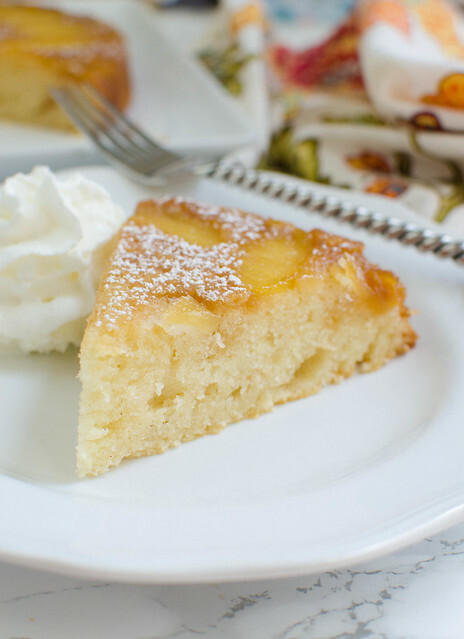 this pie would satisfy all cravings! Our Thanksgivings were always very routine, so one does not stand out any more than the other. We always went to our grandmas house. My favorite #tbt Thanksgiving is the first one we spent with my baby nephew (who isn’t a baby anymore lol). It is so fun to share holidays with little ones around. My favorite memory is celebrating with my grandparents. I miss them so much. Have many tales could tell. Must go with my Thanksgiving baby! Is 1986,had gone to the YMCA to teach my pre-natal fitness and low impact cardio classes. Came home, baked 2pies for the potluck at my in-laws. Woke up 3a.m. in labor. Called it at class the night prior. Not a 1belived me. She was born by 7a.m.Thanksgiving.My complaint was I was stuck with the hospital pressed turkey gross out dinner. No pie or dessert. Butthead family and visitors galore, not a single 1,thinks to BRING ME FOOD! But, had a gorgeous blue eyed,brown haired tiny girl baby. All was good. My family has not been around our extended family for Thanksgiving, so they are usually small–not a bad thing, but my two best Thanksgivings have been spend with friends–my friend Esther and her family when I was in college, and my friend Silvia and her huge family more recently. Great food and great people at all of them!! My favorite memory is going to grandmas’s house and all my cousins were there, lots of food and fun! I’ve been serving Thanksgiving to Navy/Marine “youngins” who have no way to get home to family for a couple years now. My absolute favorite TBT is when one of them tried to hold in his sneeze at the table and ended up shooting mashed potatoes through his nose into Kami’s hair!!! Lmao!! My favorite Thanksgiving in the last one we had with my dad! My favorite Thanksgiving memories are of drinking wine and cooking all day with my favorite Aunt! My favorite memory is my uncle’s raw turkey. We had sides for thanksgiving as it took another 3 hours to cook! Most thanksgivings are mostly the same… lots of food and family. My favorite memories are definitely any Thanksgiving I get to spend with as much of my family as possible!! My favorite Thanksgiving is my son’s first Thanksgiving. My favorite #TBT memory is when my grandparents were alive and celebrating thanksgiving with them. Thankful I still have those memories. When grandma’s hair caught on fire getting the turkey from the oven! 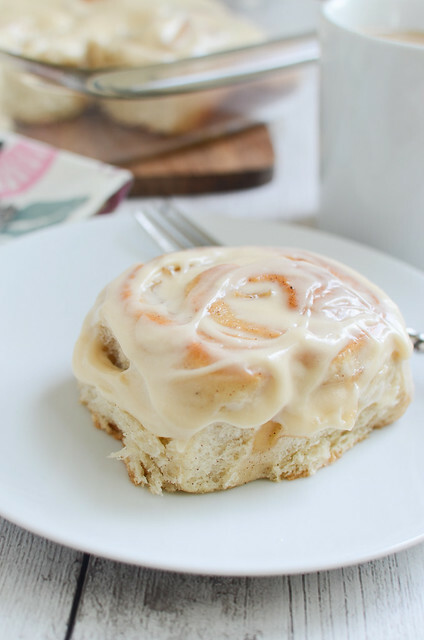 I totally understand why your family would eat 2 of these in a week!! !